I've just come across an old interview that revealed that Stephen King's ambivalence towards ebooks runs deeper than just a single novel. While this author has gotten a lot of media attention in the past few months for his decision not to allow an ebook version of his latest novel, Joyland, his decision is more complicated than simply a dislike for ebooks. This is an author who had previously been at the forefront of ebooks. His novella Riding the Bullet was an early spark in the commercial ebook market in March 2000, with hundreds of thousands of copies downloaded the first day. He was also one of the first to offer a Kindle exclusive (tied into the launch of the Kindle 2), and his online serial novel The Plant was an experiment in crowd-funded publishing (also in the year 2000). The following interview dates to 2010, and it is rather short. 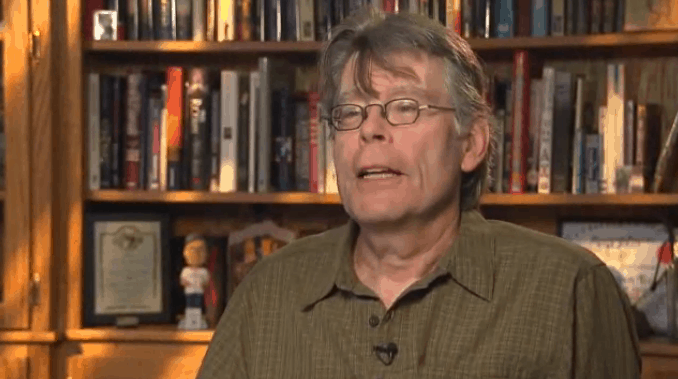 You can catch Mr King's opinion of ebooks starting at about the 1:25 mark. I suggest that you watch it through until the end. I especially like the part about the book merely being a delivery mechanism. This was a surprise for me given that Mr King said in a recent interview that with Joyland he wanted readers to have the bookstore experience. But it turns out that his feelings towards ebooks are more complicated than it first appears. I also have another interview, this time from June 2013. He offers a more nuanced explanation, and also mentions that he owns a Kindle and a Nook. You can skip to about 2:57 to hear what Mr King thinks about ebooks. As you can see in the video this decision is based on more than just dislike. Instead it is based more on the idea that he wants the act of book-buying to be some type of experiential art. In my mind that puts him in a category similar to the luddites who obsess over the smell or texture of books, but it doesn't quite make him a backward looking stick in the mud. Me, I just want to read. What do you think? I love King’s appreciation of all delivery systems, but he’s incorrect on the ‘toilet’ analogy. If you drop a paperback into the toilet, it turns into a soggy wad of unreadable paper, (and not a very nice one depending on the timing, not that I do it a lot) but if you drop a Kindle in the toilet, you have all your books backed up by Amazon online and can download again. I would say the problem is passing on your purchased books to friends and heirs, which is where the physical books win out. I’ve heard that argument about ereaders in water for the longest time but it didn’t occur to me to rebut it with the point that the data is backed up elsewhere. I can’t wait to use it. Have you ever tried to turn pages on a paper book while it is in a waterproof bag? I have no problems turning pages on my non-touch e-ink reader while it is in a heavy duty waterproof bag. Gee whiz it’s as if I said exactly what is in this article in the comments on the previous article, and I was quick to be dismissed. I told you so. I used agree with King about ebooks. Then I got arthritis in my hands, and poor eyesight. Now, holding a book open is painful, and I can’t adjust the font in a book. Ebooks make it easier for me to read, and also make my books more mobile and easier to buy. I would like it if Mr King would consider people like myself. I have been a Constant Reader for almost 4 decades. And, in fact, my switch to ebook has caused me to decide to read Kings books in order of publication, which has been enormously rewarding, and has made it so I have found books I had not read.